If you are planning a visit to Edinburgh Zoo then you’ll find that our lovely bungalow B & B, at just 2 miles from the zoo, is perfectly situated to afford you a number of benefits when visiting this exciting attraction. 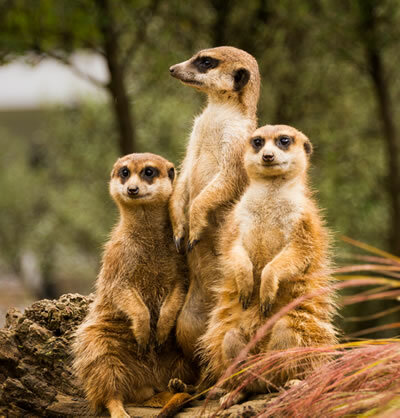 Edinburgh Zoo is well served by the local transport links so why not take advantage of our private, off-road parking facilities and leave your car with us while you relax on the bus into the city centre? From there several high frequency bus services, either the Lothian buses or the Citylink services, stop right outside the front entrance of the zoo. The zoo itself is set over 82 acres of parkland and has a host of attractions and exhibitions that are regularly updated throughout the year. Children and adults alike will love to see the giant Pandas – the only ones in the UK! When you’re ready for a rest the zoo has a good range of restaurants and eateries as well as the gift shop where you can browse for souvenirs. Thistle Dhu B & B is a lovely 3-star rated detached bungalow with its own garden and conservatory where guests are welcome to relax after a busy day’s sightseeing or in the mornings to plan their day over a cup of tea or coffee. You will start your day in the bright and airy dining room with a traditional Scottish breakfast and there are also continental or vegetarian options. If you fancy a day out in Edinburgh itself, you won’t be short of things to do and see. The Gyle shopping centre offers national retailers as well as small independent shops plus a host of eating places and best of all it is only a mere 10 minute walk from the Thistle Dhu. Also nearby -5 minutes away in fact – is Ingliston which is the site of the Royal Highland Centre visitor attraction. There is even the Gala Maybury Casino within walking distance for those who fancy their chances! As there are a good variety of restaurants all within walking distance of Thistle Dhu you’ll be spoiled for choice. The Thistle Dhu is so handily placed for all the attractions that Edinburgh and the surrounding areas have to offer which means you can leave the car behind and just relax. If you wish to make a booking with us or you would like more information then we’d be delighted to hear from you – whenever you’re looking to visit.